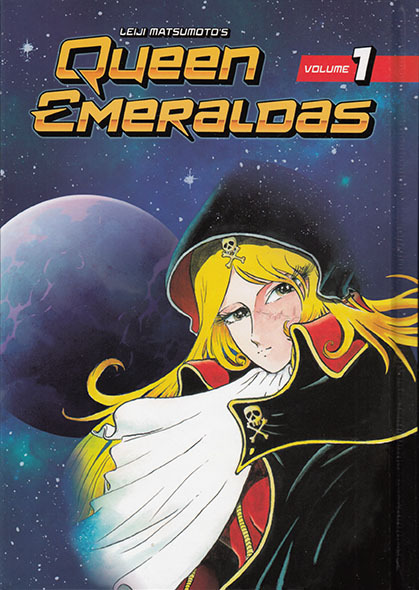 If you're familiar with Leiji Matsumoto's Captain Harlock or Galaxy Express 999, you're likely familiar with Emeraldas, the lady cosmo-pirate with the giant space blimp who's prone to surprise appearances whenever plots need advancing or machine planets need blowing up. 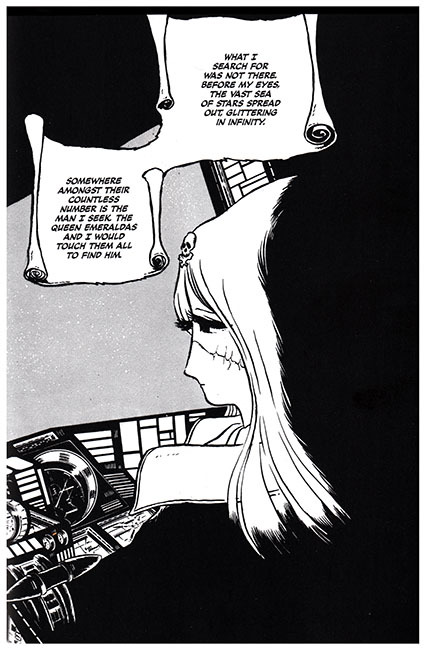 Here in Kodansha's Queen Emeraldas Vol. 1, space-fantasy manga fans here in the West are finally able to enjoy her solo adventures; and rest easy, Leijiverse fans, Matsumoto's signature style of sci-fi romanticism is in full mid 1970s effect here, a handwavey future-fantasy idiom where SF motifs mix freely with Wild West tropes and the high-tech trappings of gravity waves and space drives serve only to highlight the greater struggles of the human spirit as Emeraldas haunts the spacelanes, a mystery woman with little patience for fools or cowards. Queen Emeraldas appeared in Weekly Shonen during what must have been one of Matsumoto's busiest periods, 1978-'79. 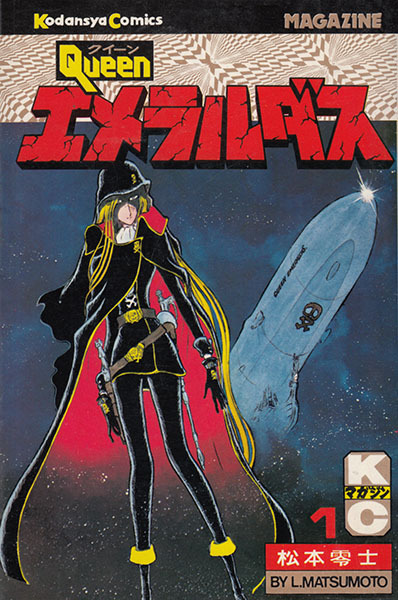 Smack dab in the middle of helping promote the Yamato boom, Leiji was also producing Danguard Ace for Adventure King, the Galaxy Express 999 manga in Shonen King, and Captain Harlock for Akita Shoten's Play Comic. Queen Emeraldas is 100% Matsumoto; the flowing scarves and cloaks and hair, the vast sky/starscapes, and the stately panels filled with elaborate space machinery covered in meaningless dials all let the reader know exactly whose comics he's reading. Manga is thought of as filmic, kinetic and fast-paced, but Matsumoto's work is a different kind of cinematic, slow and contemplative, and Queen Emeraldas is no exception, filled with long shots of windswept asteroids, double-page spreads of deep space, and tableaus heavy with impending doom. 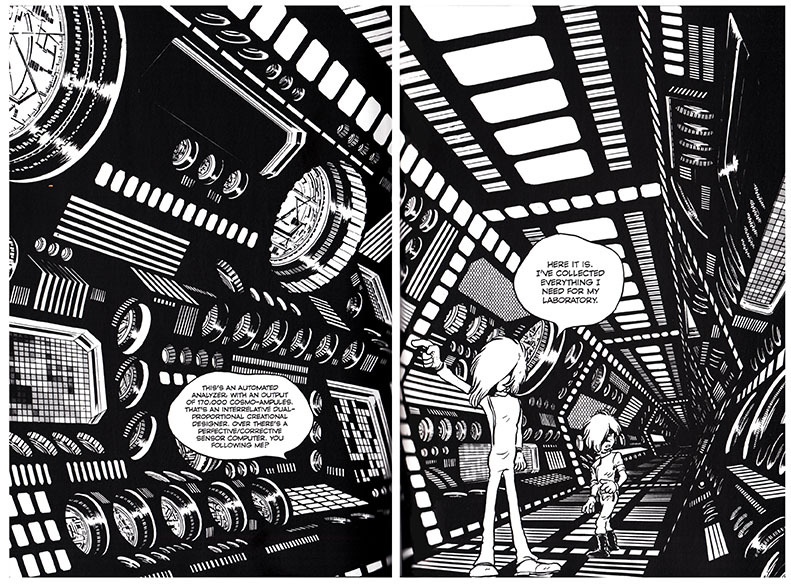 Matsumoto's atmospheric, engaging, all-natural brush line picks out every board on dilapidated Martian towns and every swirl of dust in the thin atmosphere, and his cartoonish, exaggerated characters contrast nicely with the slick mechanical renderings (perhaps courtesy Matsumoto assistant Kaoru 'Area 88' Shintani) of vehicles, weapons, space stations, futuristic cities, and the other super-constructions they utilize or inhabit. Emeraldas and other characters loom in and out of rich, inky darkness, visible in the light of endless rows of analog dials and meters and screens set against highly polished fittings. There's been a lot of animation based on Matsumoto's work, but what we see on the TV never quite seems to capture the cold metallic elegance of his manga-style brand of outer space. 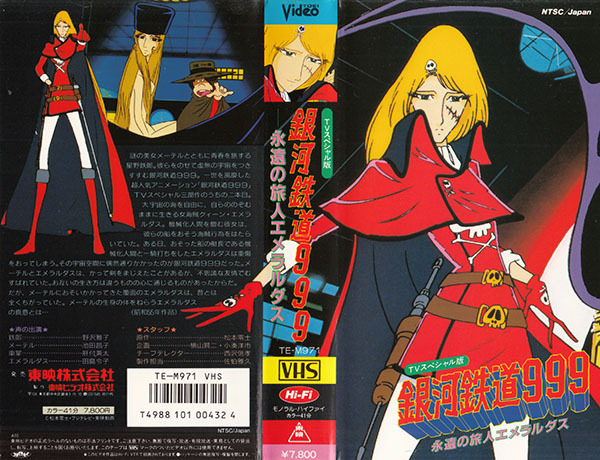 Queen Emeraldas opens as young Hiroshi Umino's patchwork spaceship augers into the rock of Martian satellite Deimos, a signature Matsumoto western-frontier space boomtown. Stranded with nothing but his pride, young Umino's True Grit touches the heart of Emeraldas, who is introduced to the reader in awestruck tones cut short as grizzled barflies shut their pieholes rather than offend the mysterious bounty hunter. Stubborn Hiroshi would die before accepting help, but help he gets anyway, and soon he's odd-jobbing his way across an unfriendly solar system where the harsh code of the West – I mean, Space – is superseded by the harsher laws of gravitational physics. Want a meditative spaghetti-western gunfight set in a spaceship's control room? Well, why not. No point in mixing genres halfheartedly. Hiroshi's poverty, potato-head physique, and casual betrayal by beautiful women bear strong parallels to the adventures of another Matsumoto manga star, Ooyama of "Otoko Oidon", the poor but proud wandering-ronin college student trying to make good on his vow to make it on his own in the big city. Or outer space, as is the case here. Eschewing help from others, Hiroshi swears to build his dream spaceship by himself; a libertarian fantasy if ever there was one, considering the vast teams of engineers and scientists required to put even the smallest satellite into the most temporary Earth orbit. At least here the text throws us a reference or two to 'construction droids,' a step up from Tochiro Oyama's bespoke hand-built space battleship seen in 1982's "My Youth In Arcadia." Matsumoto's iconic characters might perhaps be best used sparingly, as a dash of inspiring color at the edges of more direct narratives involving people who actually have things to do, and here in her own book Emeraldas is no exception. At times she almost assumes the maternal Maetel role as she watches Hiroshi's struggle from afar, only occasionally dropping in to shoot someone or make financial arrangements, or sometimes both. Emeraldas comes close to being a secondary character in her own comic, but she takes center stage when necessary to give us glimpses of her own backstory. She too fled to outer space but made it further than Hiroshi did, all the way to the planet Jura in the Ammonite solar system (that's where Harlock's Miimay is from, kinda), and we see how she receives her amazing spaceship Queen Emeraldas and how she is taught the inflexible law of survival in outer space, which involves the unbreakable rule to never ever show mercy to your enemies or allow the guilty to escape punishment no matter the cost. We'll travel to the Sargasso Of Space – every pulp SF series has a Sargasso Of Space – and see her kickstart a revolt on a planet where the non-beautiful are imprisoned, and we'll see Hiroshi labor in the mines of Ganymede and the run down frontier towns littering the badlands of the solar system. All the while we'll be lectured about what it means to be a man, about how much mercy to show our enemies (spoiler: none), and of the greatness of making our own way in the universe. Characters major and minor emote at length on flying freely without let or hindrance in their own space ships, but we're never told what it is about outer space that makes them want to go there so badly. Hiroshi Umino, and to a certain extent Emeraldas herself, aren't interested in marveling at the awesome spectacle of the universe. They aren't on a quest to save the Earth or find a space treasure or solve a space mystery. The reader looks hopefully for a plot development that at least pretends to matter to society as a whole, but our heroes are steadfast in their earnest desire to simply tool around the universe riding their machines without being hassled by "the man." Filled with characters taking extreme positions on focus-tested shonen manga ideals, sometimes these stories resemble a more lyrical version of Steve Ditko's "Mister A." However, the aggressive self-reliance of the characters is subverted by the text; for every proud declamatory speech about doing it yourself by your own bootstraps, there's a helping hand behind the scenes keeping Hiroshi (and occasionally Emeraldas) afloat. Maybe it really does take a village to launch a spaceship. Ending as it does with Emeraldas encountering a huge armada of perhaps village-launched spaceships that may be able to help her on her enigmatic quest, we can only wait for Volume 2 to witness the culmination of all this interstellar self-actualization. Kodansha's Queen Emeraldas vol. 1 is a classy, heavy hardback printed on nice paper, a professional package representative of comics today, which is to say, $30 books rather than $3 pamphlets. It's an impressive format with the downside of limiting exactly how many comics the average reader can bring home in a month – both the arm muscles and the pocketbook give out after a few of these things. I do feel with the $25 price point ($32 in Canada) they could throw in a few interior color pages, but that's me. Emeraldas has a beautifully printed hard cover and well-bound interior stock that justifies the sticker price and holds up nicely to the enormous swaths of inky space blackness haunting every other page. 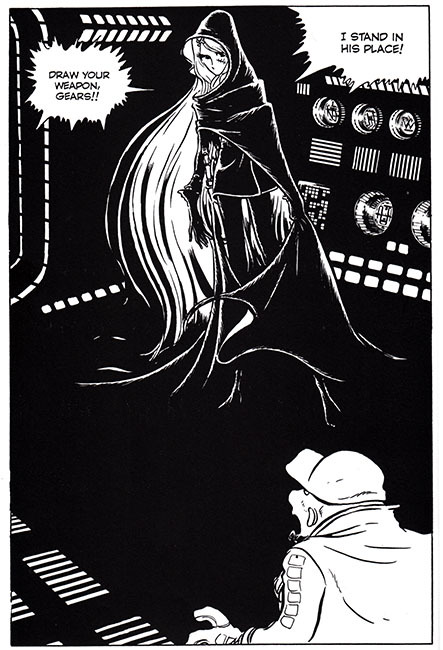 Zack Davisson's translation manages to throw in an Oscar Wilde quote and never gets lost in Queen Emeraldas' storm of SF adjectives, giving the reader both the cold formality of Emeraldas's dialogue and the seedy slang of hard-bitten spacemen and derelict space-drunks. Classic Showa-era Matsumoto manga is thin on the ground this side of the Pacific; the arrival of Kodansha's Queen Emeraldas is like welcoming a long-lost cousin who should have been here a lot earlier, warranting both "at last" and "it's about time." A manga creator as prolific and as influential as Leiji Matsumoto deserves more representation in the bookstores of America; if they can handle endless volumes of One Piece, Dragonball, and Naruto, they can surely deal with an Emeraldas or two. I look forward to continuing the journey of Hiroshi Umino and Queen Emeraldas, wherever in space they take us.